Ridley Scott’s latest biblical epic recalls the grandeur of the great epics of the 50’s and 60’s, but his script is lacking focus and despite some strong performances, the film never really comes to life. 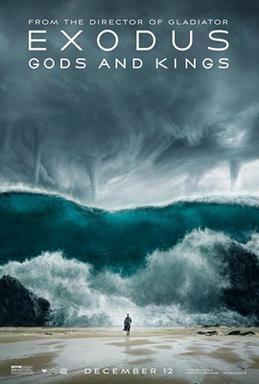 The film tells the story of Pharaoh Ramesses (played by a barely recognisable Joel Edgerton) and Moses (Christian Bale), his confidante (and later enemy when his Hebrew lineage is discovered), and it is a loose adaptation of the Book of Exodus which focuses on Moses leading his fellow Hebrews away from Egypt. Bale and Edgerton both put in strong performances, and it’s a shame that they don’t share too many scenes throughout the running time. Ben Mendelsohn is the pick of the supporting cast, entertainingly hamming it up as Viceroy Hegep, an Egyptian official who oversees a large group of Hebrew slaves, whilst there are smaller parts for John Turturro, Ben Kingsley and Sigourney Weaver. The main problem with the film is that it feels like such a slog, and that’s largely down to the plodding script. Whilst Scott mostly delivers in the big scenes, there is a sense that the major events of the story were pencilled in with the remainder of the film being an afterthought and this doesn’t help the viewer to become emotionally invested in Moses or the Hebrew people’s plight. The spectacle is undoubtedly impressive, with stunning production design and effects that really shine through in the plague sequences and when Ramesses chariots go hurtling around the mountain on the thinnest paths, but somewhere along the way the human element has been lost. There’s too many scenes that feel inconsequential and beyond Moses, the rest of the characters feel underdeveloped (even Ramesses isn’t given as much depth as I would have expected) with paper thin motives that seem to fall narrowly into Egypt = bad; Hebrew = good, and that’s disappointing in any film, never mind one of such length and ambition. We don’t really see many biblical epics being made these days, and it’s a shame that the last couple of efforts (this and ‘Noah‘) may have better access to quality special effects, but they seem to forget the very basic requirements of good storytelling whilst concentrating on the aesthetics. Overall, there’s enough to enjoy in ‘Exodus: Gods and Kings‘ from the performances to the impressive spectacle, but it feels slightly lacking and its output doesn’t match its undoubted ambition which is a shame.